This entry was posted on May 25, 2016 at 6:41 pm and is filed under Jean Giono. You can follow any responses to this entry through the RSS 2.0 feed. You can leave a response, or trackback from your own site. Very nice review but David Abram is not the translator–he wrote the introduction. Paul Eprile is the translator. What a terrible mistake, especially as I went out of my way to complement the translation! I will correct it. A very interesting review as ever, Grant. I was quite tempted to join Scott and Dorian’s readalong, but when I looked into the novel’s availability in the UK it seemed a little hard to track down. Funny you should mention the Seethaler as it came to mind as I was reading the blurb on the Giono on the NYRB website. That said, this sounds like the better book (shame I’ve got the Seethaler but not the Giono!). I do like the sound of it being a meditation of man’s relationship with nature. Yes, I think you would like it. How strange it’s now difficult to get hold of – perhaps it’s the popularity of the read along! I wanted to join this readalong as well but I ran out if time. 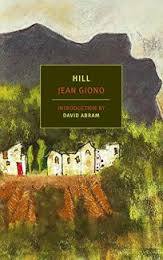 I’ve read other books by Giono and they are always a joy. Will you read the other two in the trilogy as well? Since I didn’t like Seethaler either, I’m sure I’d like this. I’d like to read the other two (though I didn’t know when I read it that it was part of a trilogy). Are they simply his first three novels? If so, I’m not sure how easy they’ll be to get hold of. Yes, they are the first three. In French they are called La trilogie de Pan but usually they are not grouped in one book. I have the here (the French editions) and they seem longer than the first. I read and reviewed To the Slaughterhouse on my blog. It’s an outstanding book as well. Just saw your review as I was posting mine, Grant, and am pleased to see that you appreciated this one as much as I did. I’m struck, in your choices of quotations, by what you note as “too many memorable phrases to mention,” since I picked out others and felt the same way. The language is just incredibly rich, isn’t it? I’ve commented in my post on the outstanding translation especially given the utterly exquisite and inimitable French original. I felt enormously grateful to be able to read both. I also love your point about the language never “straying” from the world of the novel, “enhancing the sense of a closed eco-system.” Giono quite literally constructs a world in his novel, while simultaneously thematically underscoring the importance of language in constructing the world, and your point also gets at the “ecological” vision that Giono conveys. I feel almost compelled to revisit Seethaler’s book, which I liked, but he is certainly no Jean Giono. To be fair, few writers are. I think I’ll be reading more of Giono before I return to Seethaler! Are there any of his novels in particular you would recommend? I should have corrected Dorian’s impression that I knew a lot about Giono. I don’t, other than this having not been my first encounter with him. I’ve now read four of his novels plus his enchanting The Man Who Planted Trees, and they have all been quite different, though filled with the same rapturous prose and attention to nature. Que ma joie demure (translated as Joy of Man’s Desiring may be my favorite, though I read it so many years ago I could well do with a re-read (in fact, I’ve already pulled it down from the shelf). He also wrote some interesting “pot-boilers” after WW2 when he came into disfavor for his pacifism, but in the one I read – Un Roi sans divertissement (A King Without Distraction – he can’t let go of an intensity in exploring the landscape and people of the region. I loved it. There’s a film version that doesn’t quite live up to the book but is interesting enough (and features, rather incongruously, the singer Colette Renard). I agree about finding at least one line per page worth quoting. As I noted in my post, the French is completely exquisite – which makes Eprile’s accomplishment that much more impressive. I certainly intend to read more of his work, but what I read next may depend on what I can get hold of. So much of what has been translated is now out of print. It would be great if NYRB had more in the pipeline. Or perhaps a publisher will reprint some of the novels Harvill brought out as Pushkin Press has done with Leo Perutz. Here’s hoping someone in publishing is reading all these posts! I agree this book is a joy to read. Thanks for your review! I really admire how much you are able to say so succinctly. My posts are always too long. Completely agree that the book speaks very much to our concerns today. I wonder if that’s because it isn’t particualrly sociological (about the peasant way of life, say), even though it’s totally grounded in a specific place. You say succinctly, I say not having enough time! I think you’re spot on about it not being sociological and that’s perhaps why it feels so timeless. Thanks for suggesting the read along. I just want to second Dorian’s praise of your enviable ability to convey so much so succinctly! Also, addressing the other part of Dorian’s comment, I found Giono obviously had a deep understanding of the way of life of his peasants, but quite beautifully balanced the particular details he chose to convey about them with the more universal elements of his story. No, he’s not sociological – he not attempting a complete ethnography – but at the same time he gives a quite distinctive sense of how these people live, how they work, how they think about things, how they interact, how they view the outside world, what they eat, etc. That was one of the differences with Seethaler I felt – lived experience versus imagined. Thanks for introducing me to Giono! Yes, I think that’s just right. It would be interesting to compare him to someone like Zola (maybe in The Earth?) to see how a different writer handles people who work closely with that land. Giono seems so at ease in the world he’s describing that he doesn’t feel the need to be an ethnographer of it. The building tension, the ominous and mysterious mood, the personification throughout, all made this book so compelling to me. And, I like to muddle through exactly what the author is saying. To me, it was more about man vs. nature than anything else, but of course there were more profound things going on, such as putting the blame for misfortune on someone else. I loved the portrait of rural life, of life in France from another era. I loved picturing the scenes from the hill, even the fire with its candelabra to which Gondran succumbed was somehow glorious. Yes, there’s so may wonderful things in this book, and so much to think about. Definitely a timeless book that shows man’s relationship with nature. The descriptions of rural life made for great prose even in translation! I thought the translation read very well and, as you say, the novel feels like it could have been written at any time. “Stylistically, its short paragraphs and sections of direct speech perfectly suit both the characters and the building tension.” So true! I especially appreciated the way the dialogue was presented especially Janet’s interactions with people. One was not immediately sure who was speaking as the lines shot off one after the other without identifying the speaker directly. But very quickly, in small clever ways, the speech is so linked to how the character is defined that its source is clear. And that says a tremendous amount of a book that is not character driven – unless you count houses and cats and hills and many things as characters. I didn’t comment much on the dialogue but I thought it worked very well. The ‘knowing who was speaking’ also drew the reader into the community. I also felt the short paragraphs suited both the pace and the mindset of their life. I don’t know the author or the book, so I’m glad I saved your review to read since it sounds tremendous. Marvellous quotes. It reminds me of the first John Berger I read (Pig Earth, there’s a review at mine) which focuses closely on French peasant life but without perhaps the same emphasis on nature itself. I should read this, and I should read the two books that followed that Berger given how much I liked it. Yes, it’s been my find of the year so far. Not sure why people are finding it difficult to get hold of – NYRB books are usually easy to come by in the UK. You’ve reminded me that I must read John Berger, though. I thought of those wonderful Berger novels as I was reading Hill too. They seem quite different though. Giono’s not a Marxist, for one thing. Maybe it’s that he takes less distance from his characters. Or that they’re different kinds of characters than Berger’s. Hm, it seems to be out of print in the UK, though perhaps the new edition just hasn’t arrived yet. I note Giono wrote The Horseman on the Roof. I don’t know the book but the film based on it is rather good. He did. I’ve just got a prequel he wrote to that, Angelo, (though he wrote it after) which I might read next.